The stupendous image of Lord Krishna, the magnificent architecture and the rich historical heritage are the salient features of the temple at Tiruppaadagam. Lord Krishna in the sanctum sanctorum is 25 feet tall – tallest. 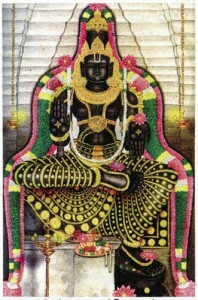 No temple in India has so tall a Perumal in a sitting form. The temple for PANDAVA DOOTA PERUMAL (SRI KRISHNA) is situated in the heart of KANCHIPURAM (PERIYA KANCHI), very near Ekamranatha’s temple. 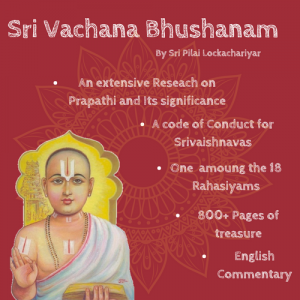 It is one of the 108 divya desa-s eulogized by PERIYAZHVAR, BHUDATTAZHVAR, TIRUMAZHISAI AZHVAR and TIRUMANGAI AZHVAR, all of whom speak of this place as PAADAGAM. 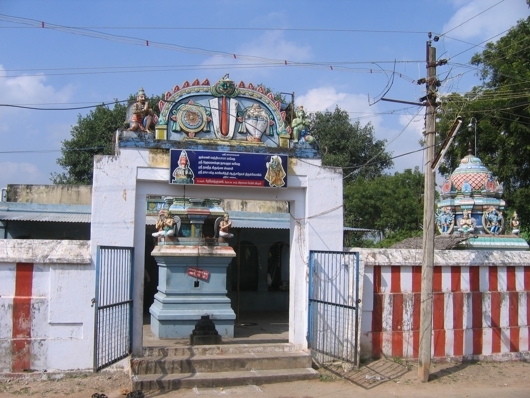 The inscriptions in this temple also speak of this place as TIRUPPAADAGAM and refer to the deity here as TIRUPPAADAGATTAZEIVAR. This temple, together with the YATHOKTAKARI temple, TIRUVEKHA (which is mentioned in the Perumbanatiruppadai, a tamil work of the sangam age believed to have been composed between the 1-3 C.E.) 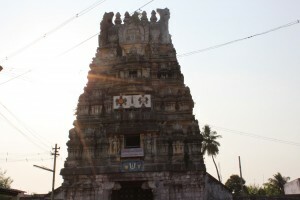 and the ULAGALANDA PERUMAL temple, URAGAM, are considered to be among the most ancient temples in KANCHIPURAM. The majestic and unusually large images of Lord VISHNU at PAADAGAM, URAGAM and TIRUVEKHA seen in the sitting, standing and reclining postures respectively are of stucco (sudhaa) and not of stone as usually seen in most temples. According to scholars, these images were probably set up for worship even in the pre-pallava times, i.e., in the sangam age. The STHALA-PURANA of this temple is associated with an interesting episode found in the Mahabharatha. When SRI KRISHNA went as an emissary (DOOTA) of the Pandava-s to the court of the Kaurava s at Hastinapuram to request Duryodana to follow the path of peace and avert war, Duryodana hatched a plot to capture and imprison KRISHNA. However, the Lord at that time assumed His VISHVAROOPA form and the crowd at Duryodana’s court began to worship Him. With KRISHNA’S grace, the blind Dhritarashra was able to have the vision of the Lord’s VISHVAROOPA. The awe-inspiring, gigantic image of Lord KRISHNA at PAADAGAM is believed to be this VISHVAROOPA form, which He revealed to Janamejaya, acceding to the wish of this king who performed severe penance. The colossal image of Lord KRISHNA in the PANDAVA DOOTA temple, the like of which is not seen in any other shrine, faces east and is approximately twenty-five feet in height with His crown almost touching the roof of the sanctum. The deity, with a serene countenance and beautiful smile, is seen seated in the ardha-padmasana posture with His right leg bent and His left leg placed in front. His right hand shows protection-gesture (abhaya) while His left hand indicates boon-giving gesture (varada). 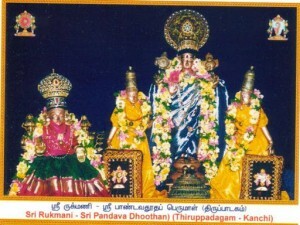 While Lord VISHNU icons in most temples are shown with four arms (chaturbhuja), the one here at PAADAGAM is two-armed, probably indicative of the human incarnation of KRISHNA. The processional deity (utsava-murti), in this shrine, is a four-armed VISHNU flanked by SRI DEVI and BHUDEVI. 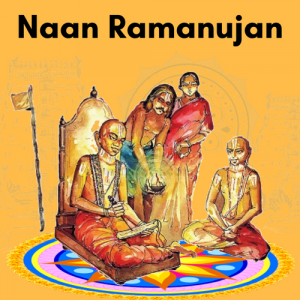 Swami Arulala Perumal Emperumanar, also called Yajnamurthy visited here, held a debate with Sri Ramanuja and surrendered to him after 18 days. 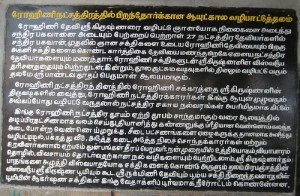 Acharya Manavala Mamunigal also had visited this place. The main sanctum enshrining PANDAVA DOOTA PERUMAL is very large, in keeping with the huge size of the Deity. It is rectangular in plan with a very high barrel-shaped roof known as BHADRA VIMANA. The original shrine was probably built of brick and later remodelled in stone during the Chola period, about the 11th-12th centuries AD. The maha-mandapa in front of the main shrine also belongs to the Chola age as seen from the pattern of the pillars. There is a mukha-mandapa in front, which was constructed, probably later, during the Vijayanagara age. 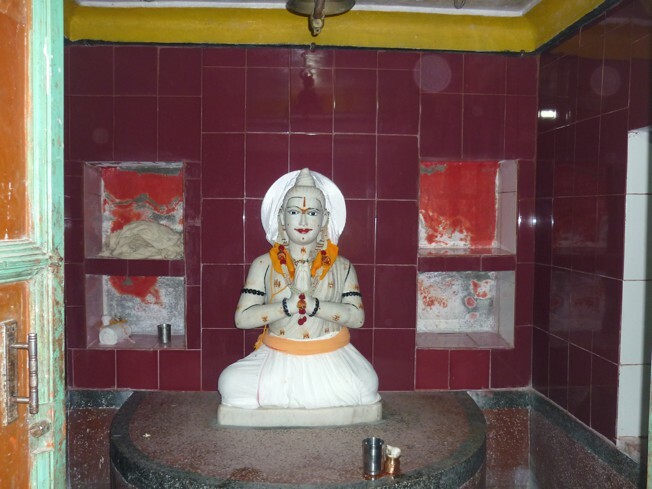 This temple has only one enclosure (praakaara) and very few sub-shrines. The sanctum of Goddess RUKMINI, the consort of Lord KRISHNA, situated close to the main shrine on the SOUTH side and facing EAST, was also probably built or re-built during the Chola days. 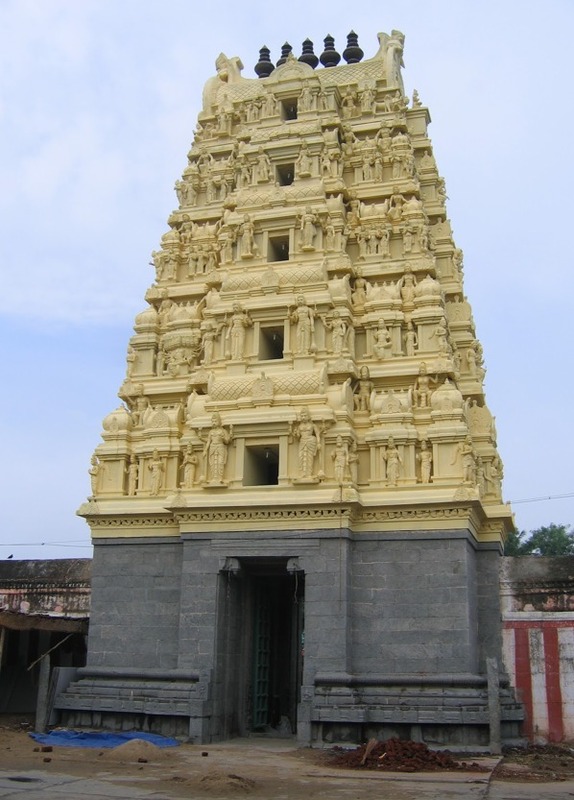 There is a sanctum, constructed in recent times, enshrining the idol of SUDARSHANA (CHAKRATTAZHVAR) with Lord NARASIMHA on the reverse situated to the NORTH of the praakaara. 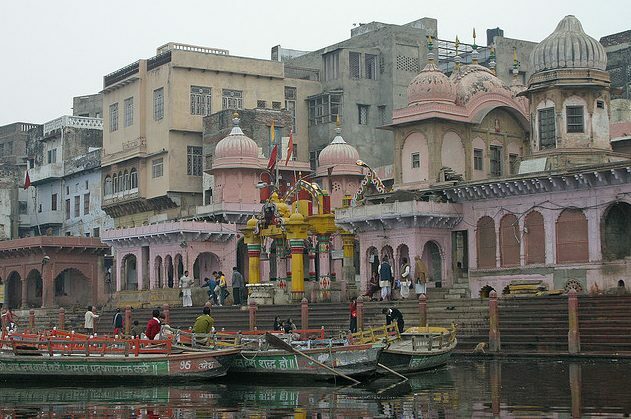 On the NORTH-EASTERN corner of this temple-complex is the sacred tank (PUSHKARINI) known as MATSYA TIRTHAM. The main entrance to this temple is through the EASTERN doorway, with a small four- tiered gopura, constructed during the Vijayanagara times. 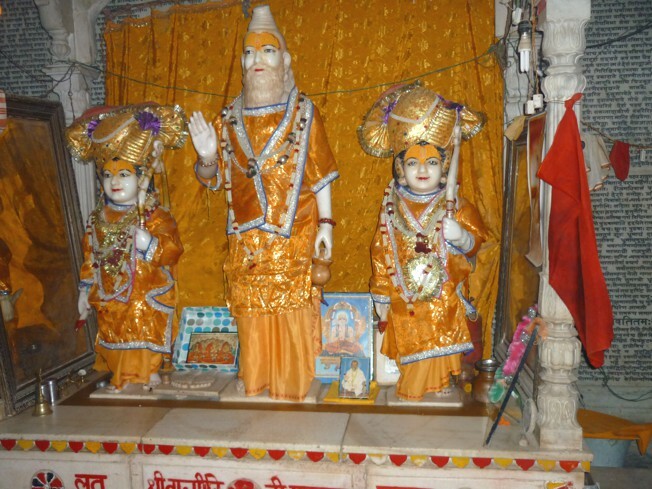 A few historic inscriptions are found etched on the walls of this temple, which provide information about the benefactions made to this shrine in the ancient days. The earliest of these epigraphs, found on the NORTHERN wall of this temple, is dated 1075 A.D. and belongs to the reign of the Chola ruler Kulottangan (1071-1122 A. D.). 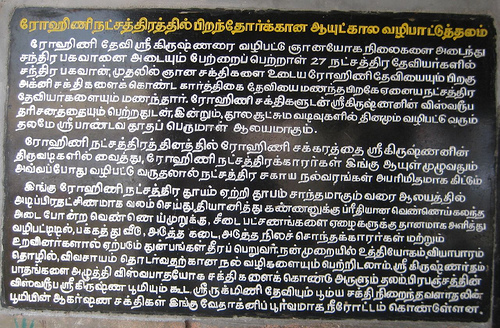 This inscription states that a merchant named Arulaladevan, living in KANCHIPURAM, provided the temple of TIRUPPADAGAM with a flower-garden and purchased some land from the assembly of the village of ORIRUKKAI (near KANCHIPURAM) to support the gardeners and their families. 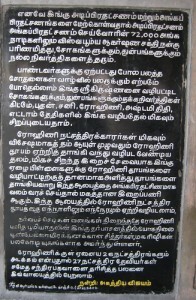 Another inscription, of the reign of the same ruler dated 1109 A.D. found on the SOUTHERN wall of this temple registers an undertaking given by Dutakari Tiruvaranga Mani Bhattan and Ninra Narayana Bhattan who were performing worship in the temple of TIRUPPADAGAM, to supply daily a certain amount of curd for the offerings to God in lieu of interest on the gift money received by them. The gift of two kalanju and two manjadi of gold was made by a merchant of KANCHIPURAM. It is possible that DUTAKARI, the name of the priest of this temple mentioned in this inscription, could be after KRISHNA, the messenger of the PANDAVA-S. The third epigraph inscribed on the WESTERN wall of the central shrine of this temple is dated 1167 AD and belongs to the time of Rajadhiraja Chola (1163/66- 1179/82 A.D.). This inscription speaks of the gift of thirty-two cows for maintaining a perpetual lamp to Lord TIRUPPAADAGATTAZHVAR by a person named NIRAININDRAAN. 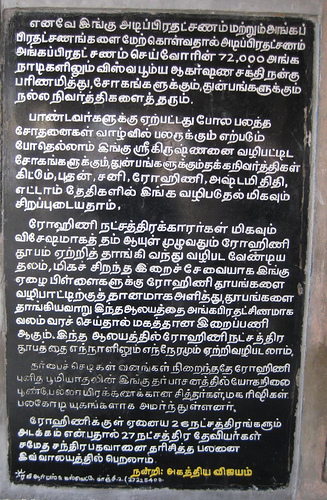 Interestingly, a SANSKRIT epigraph of the PALLAVA age of the 8th century A.D. found in the SUNDARAVARADA PERUMAL temple at UTTIRAMERUR near CHENGALPATTU (KANCHIPURAM District) provides some information about the talented architect, named PARAMESHVARA, who constructed this outstanding VISHNU temple. He is mentioned as an expert among architects who hailed from PATAKA (PAADAGAM) in KANCHIPURAM. It is possible that this architect may have contributed to the PANDAVA DOOTA PERUMAL temple at PAADAGAM also. A number of festivals are celebrated in the PANDAVA DOOTA PERUMAL temple, the most important one being the BRAHMOTSAVA during KRISHNA JAYANTHI (SRI JAYANTHI) celebrations in the TAMIL month of AVANI (AUGUST-SEPTEMBER). During the month of KARTHIGAI (NOVEMBER-DECEMBER) under the asterism BHARANI, a festival is conducted in honour of ARULALAPPERUMAL EMBERUMANAR. It is the belief of the devotees that Rohini born would cross over any problems if they pray Lord Pandava Dhoodha in the temple. This is the shrine where Lord Krishna graces His devotees with Viswapadhayoga powers pressing His feet on earth. Hence, those circumambulating in the temple in adi pradhashinam (step by step method) or Angapradhakshinam ( roll around touching the earth with all parts of the body) would have all their 72,000 veins healthy to resist any infection. Worshipping the temple on Wednesdays, Saturdays and Rohini Star days, Ashtami the eighth day from new moon or full moon days and on the eighth day of the month would gift the devotees with all prosperity and health. The temple is open from 7.00 a.m. to 11.00 a.m. and from 4.00 p.m. to 7.30 p.m.